I got there with two like-minded fellows about 90 minutes after the gates opened on Saturday and we had a pretty good time. The upside of attending festivals early is "low crowds, everything still available" and this was no exception. Yes, you might not be around when Oakshire drops their rare entry, but I'm okay with that trade off. I would agree that the "Rare" rotation could have been documented a bit better, but complaints are obviously going to be louder from those standing in a 5-deep line and finding that out vs. those in line for 10-minutes and finding that out. When in doubt, get there early. Got to disagree on the Ninkasi - the pinot was there, but I failed to pick up any major influence of the cherries. Agree on Hopworks (wanted to rename it Hot and Filthy) and the Bramble (didn't have it here, but did at the PCTBB). Also enjoyed Breakside's Mango IPA and Alameda's Huckleberry version of Yellow Wolf. I'm sure Year Two will be an improvement on several levels. There's no accounting for taste, is there? I'd put Widmer in my top five and say the Laurelwood was the biggest dissapointment. Laurelwood was the only beer I was telling people to avoid (which, perversely, convinced someone to try it)--the rest were one variety of winner or another. Wow, two disses on my beer choices. As for the Widmer, I heard from a lot of people with really good taste that they loved it. Oh well. It wasn't bad... for me, it was just all raspberry and nothing else. Thanks for the link. So you know my favorites, here's my biggest disappointment and the one I warned people away from: Hopworks Red Delicious. Not only did it have a metallic quality but it tasted like dirty dishwater. Overall, a great time and I can't wait for year 2. 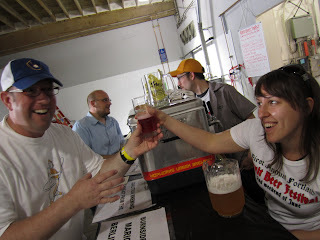 Loved the Block 15 Psidium---favorite beer of the fest. Overall though, had a good time at the festival, but really enjoyed sitting at the bar after drinking the Burnside beers. Had not been overwhelmed with their stuff earlier, but really enjoyed the Oatmeal Pale and the new Berliner-Weisse---just great stuff.